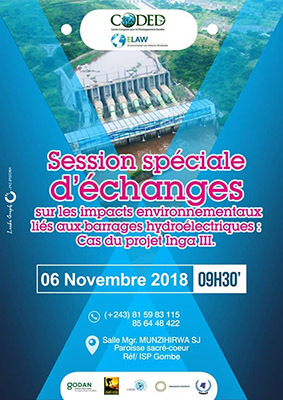 The Democratic Republic of Congo proposes an enormous hydropower scheme, known as the Grand Inga, for the Congo River. The first phase of the project, Inga 3, would include a dam and hydroelectric plant at Inga Falls. Inga 3 threatens to displace 30,000 people in seven villages, jeopardize public health, and disrupt local ecosystems. This week, ELAW partners at the Centre Congolais pour le Droit du Développement Durable (CODED), held a workshop in Gombe, Kinshasa, for candid discussion to educate stakeholders about Inga 3, what is at stake, and how citizens can make their voices heard. "Only 15% of Congolese have electricity, but smaller, local plants might be a better solution,"' says Erick Kassongo, CODED Chair. The workshop provided a forum for discussion, reflection, and sharing to better understand the environmental impacts of hydroelectric dams. Erick says, that for the first time since the establishment of the Agence pour le Développement et la Promotion de Grand Inga (ADPI), Agency Chair Bruno Kapanji accepted the invitation to participate in the dialogue. ELAW Staff Scientists had reviewed the environmental impact assessment (EIA) for the Inga 3 project, including pre-feasibility studies funded by the African Development Bank. They found several flaws and a lack of information on the potential environmental and health impacts of the project. Erick Kassongo (second from right) joins participants at this week's workshop. "Access to information about proposed mega projects can be a major hurdle for communities seeking to participate in the decision making," says Jennifer Gleason, ELAW Staff Attorney. "We are pleased to be collaborating with Erick Kassongo and his colleagues at CODED to ensure transparency around plans for Inga 3."